An impressive collection of 500 recipes at your fingertips! Make the recipe all at once, if you have time; or, use the accompanying suggestions on what parts are best to make ahead separately if you’re short on time that day. Every recipe has been tested thoroughly on what’s best to make when, and how to store it, to give your results a just-made flavor. Included in this compendium of new recipes are a few fan favorites that have been thoroughly re-tested and adjusted for the best results if you need to make a component in advance. 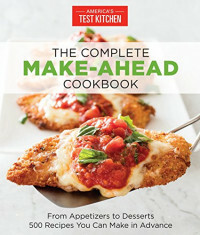 You'll find classic, international and modern flavors with recipes such as Breakfast Strata, Mini Chicken Empanadas, Olive Oil-Sea Salt Pita Chips, Chickpea Cakes, Cauliflower Gratin, Stuffed Eggplant, Mexican Lasagna with Turkey, Tequila-Lime Turkey Chili, Moroccan Chicken Salad, Beef Tamale Pie, Smoked Salmon and Leek Tarts, Blueberry Streusel Bars, Maple Pecan Pie, Flourless Chocolate Cake and Bourbon Whipped Cream. In addition you’ll find information basics for refrigerator and freezer storage, how to freeze egg yolks and egg whites properly, and the ultimate guide to storage containers – all to help give you the best tasting results!